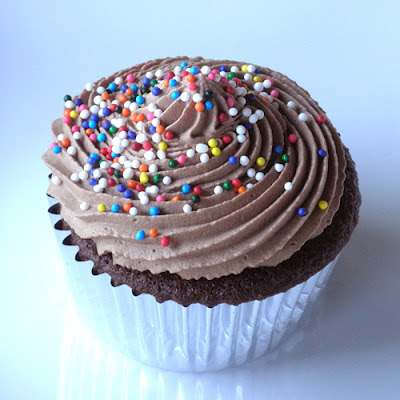 I have a couple of versions of this recipe on this blog (see Cocoa Whipped Cream Cupcakes and Chocolate Times Three Cupcakes), because every time I make it, I change it up. So, then I have to take new pictures and post the complete recipe for the variation. It keeps me off the streets. I felt like making these cupcakes last night, but I just couldn't bring myself to do it. I just wanted to relax with my kids, and so I did. I couldn't get it out of my head, though, and because I was home anyway today because my sister-in-law came over to hang out, I decided to just go ahead and make these. I've made them enough that they actually don't take very long. And they ARE one of my favorites. Maybe even my very favorite. I might have to make them again next weekend for my birthday. The cake itself is so tender, so soft, that it practically melts even before it gets to your mouth, and the cocoa whipped cream is just like fluffy chocolate ice cream, really. Light, creamy, and just lovely to eat. If you don't have cake flour, go to the store and get some. It makes a difference. That's all I have to say. I think I'm going to go eat another one of these now. Line 2 twelve-cup muffin pans with cupcake liners. Set aside. Into a mixer bowl fitted with a whisk attachment, sift flour with ground chocolate, cake enhancer, sugar, baking soda, cream of tartar, and salt. Add butter and 3/4 cup buttermilk. Beat on low speed to combine ingredients. Scrape sides of bowl and then beat on low-medium speed for 2 minutes. Add 1/4 cup buttermilk, eggs, and 1 teaspoon vanilla. Beat additional 2 minutes. In a small mixer bowl, mix cocoa and sugar. Stir in hot water until a smooth paste forms. Add cream. Beat just until firm peaks form. Do not over beat. 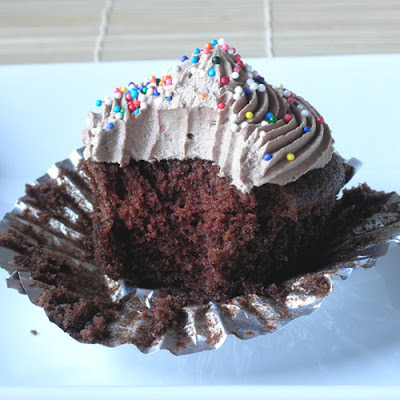 This cupcake is fabulously light. Wow! Yummy looking cupcakes and the frosting looks like it is to die for. These do need to be refrigerated. I've always wondered about the cream cheese frosting thing.